This recently-completed vase (measurements 9-1/2″ tall, 3-3/4″ diameter) was made from slabs, using a cylindrical form. 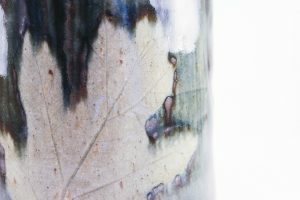 A half-dozen interesting autumn leaves were pressed into the damp clay, and 3 coats of black slip were applied. 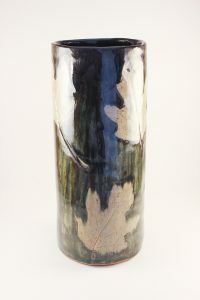 After the bisque firing, the inside was coated with John’s Black glaze, and the outside was dipped in VA Clear glaze. The imprinted leaves turned out speckled, and their stems and ‘veins’ show up nicely. The overall effect on the outside is streaky and bark-like, enhancing the appearance of the leaves.